Garbage Disposal Plumbing Tips | Weilhammer Plumbing Co. Inc.
Plumbers know that garbage disposals are among the most misused appliances in households. That is because many homeowners do not recognize that garbage disposals are not meant to be used as blenders for large deposits of food. Instead, they are designed to grind leftover food residues that are rinsed from plates. Anything more substantial than that, other than the occasional ice-cube cleanse, is not meant for residential garbage disposal systems. Disposing of large quantities of food will result in a call to your local plumbing company for garbage disposal repair. It is the most common reason why disposal systems clog or breakdown. To prevent garbage disposal problems, continue reading for some helpful usage, cleaning, and maintenance tips. Sometimes, when your garbage disposal is whirring but just not working, it may be something that can be easily resolved on your own. First, press the “reset” button located on the bottom of the disposal underneath your sink. If this doesn’t help, turn the power OFF to your garbage disposal and grab a flashlight. Peer into the drain and look for any solid objects, such as twisty-ties, bottle caps, or anything else that could be holding up your system. If you do see something, carefully pull it out with a pair of pliers or some type of grasping tool. Never put your hands in the disposal! And if you use pliers, be careful not to damage the blades or other inner components of your garbage disposal. Your garbage disposal may also come with a hex-jam key, which is a tool used to unclog or un-jam the system. These keys are usually taped to the bottom of the disposal, next to the opening where it is inserted. Simply insert the key and wiggle it around a few times to release any blockages. For garbage disposal odors, there are a few simple tricks to try out. On a routine basis, it is important to clean your disposal to eliminate food and bacteria residues. On a routine basis, grind some ice cubes while running cold water for a minute. This will keep the blades fresh and sharp. You can also grind citrus rinds for a fresh scent. Also, while the disposal is running, pour some liquid dish detergent inside the drain to eliminate bacteria and other contaminants. Finish by running cold water down the drain for a couple of minutes. It is recommended to clean your garbage disposal every few weeks, and more often for those who use it frequently. Call Weilhammer Plumbing Co. Inc. at 317-784-1870 for professional and affordable garbage disposal repair in Indianapolis, Indiana. Master plumber, Mark Weilhammer, and his team of licensed plumbers, have decades of experience in the plumbing industry, and can repair a garbage disposal in no time at all! 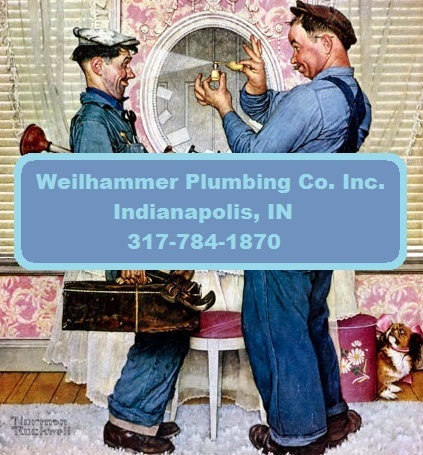 Our family owned and operated business have served Hoosiers for over 100 years, so there is no better choice for dependable plumbing service in town. We offer a wide range of residential and commercial plumbing services, including water heaters, water softeners, water purification, and more. Call 317-784-1870 to request a free estimate for Indianapolis garbage disposal repair, today. This entry was posted in garbage disposal repair and tagged clogged garbage disposal, garbage disposal cleaning, garbage disposal help, Garbage Disposal Odor removal, garbage disposal problems, garbage disposal repair, garbage disposal service, garbage disposal tips, Indianapolis plumber, smelly Garbage Disposal. Bookmark the permalink.